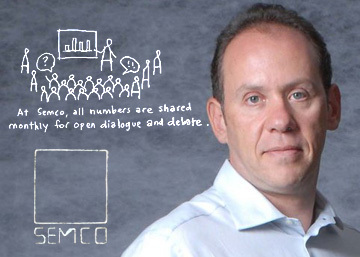 Building Workplace Democracy | Fourth Dimension Inc.
A case study on corporate community building based on the book “Maverick” by Ricardo Semler who inherited a traditional manufacturing company, SEMCO, from his father and transformed it into an exemplar of workplace democracy. Self-governing workforce; empowered groups; profit-sharing; flattening the hierarchy; integral view. Factory workers set their own production quotas and come in any time between 7 a.m to 9 a.m. to meet them without any pressure from management or overtime pay. Managers for their part can run their business units with extraordinary freedom determining business strategy without interference from the top boss. Initially worker committees were given a broad mandate to look after the workers’ interest and concerns like for example pay and working conditions. Members of the group are also given time off with pay, to dedicate themselves to the new job. The other important aspect of SEMCO democracy is that labour unions are accepted as a part of it and union representatives are included in the worker committees. Forming teams to paint offices and machines. Advancing further, worker committees turn their attention to concerns related to management. And SEMCO management allows worker-committees to look at the managerial cadres and behaviour with a critical and questioning eye. The workers ask critical questions on the relevance of some managerial positions like strategic planning manager and thereby help the management in identifying surplus managers. They are also given the freedom to question the snobbish behaviour of managers. For example when Semler has to cancel a worker-committee meeting because the date clashed with a managerial retreat, a worker questioned Semler on the purpose, nature and cost of such retreats. When the bosses told the truth about the retreat another worker muttered, “Sheer waste.” And management responded positively to workers opinions and reduced the expenses, number of participants and the lavish entertainments indulged in such retreats. And finally, workers take responsibilities and functions belong to management like choosing the location for a plant, suggest major changes in products, designing new production process set production goals, mange plant cafeteria. The following example brings out concretely the spirit behind SEMCO work-culture. When SEMCO wanted to build a new plant, 120 employees of the unit, were given all the pertinent facts like for example the reasons for moving, budget etc. Workers formed search parties and finally choose a vacant factory which was next to a factory that was frequently on strike. Managers were hesitant and apprehensive but still respected the decisions of the workers and moved in. After entering into the plant, workers designed a new and flexible manufacturing system which is very different from the Ford-type of assembly plants. After the employees became reasonably well informed of the financial condition of the company, SEMCO management enters into a long and intense negotiation and discussion with worker-committees to arrive at a fare and acceptable formula for sharing wealth for each plant. In SEMCO, the formula is something like this: Total profit is revenues minus expenses. 40% would be deducted for taxes, 25% for dividends to shareholders, 12% for reinvestment and the remaining 23% to be shared with employees. Finally, the money is given to the worker-committees to distribute them according to what they think as best. The traditional organisations, as they grow bigger, tend towards a complex bureaucracy with many layers of hierarchy. SEMCO also fell into this trap. But Semler was fully aware of it and made a conscious attempt to eliminate bureaucracy and unproductive layers of hierarchy. In a retreat, Semler figured out an innovative organisational structure made of just four levels of hierarchy: Counsellors, Partners, Coordinators and Associates. Counsellors belong to the top management cadre who will frame and coordinate the general policies and strategies of the company. Partners are the leaders of Company’s business units and plants. Coordinators are the managers and supervisors of basic functions like marketing, finance or production. All the rest are called as Associates. Most of the traditional companies live in the techno-economic level focused on achieving higher levels of efficiency, productivity and profit through application of technology using the term to include engineering as well as management technology. But a business organisation is not merely an economic organism but also a social organism, a human community with a social, political and cultural dimension. So if an organisation wants to progress further from the techno-economic stage, it has to move up to the social and political dimension, which means it must make a conscious attempt to build a human community governed by the triple values of French revolution: Liberty, Equality and Fraternity. When a company makes a successful attempt in this direction, it leads to a greater and higher manifestation of human potential – individual and collective – in the organisation. SEMCO’s achievements represent this higher step in organisational evolution. To progress further in this stage of evolution SEMCO has to make a more and more conscious attempt to understand, implement and manifest this triple values in the inner being and outer life of people in the organisation.